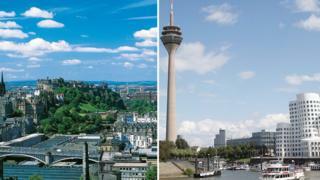 The plane, which started at London&apos;s City Airport, was then redirected and landed in Dusseldorf. WDL Aviation ran the BA flight through a leasing deal. BA say the pilot wasn&apos;t lost at any point, but because the paperwork said Edinburgh, the flight simply took that route. Image caption WDL said it was investigating the "obviously unfortunate mix-up of flight schedules"
Published on Mon, 25 Mar 2019 13:38:46 GMT, © All rights reserved by the publisher.